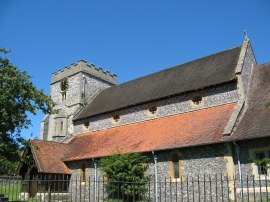 Myself and Sara did this walk on Sunday 26th June. 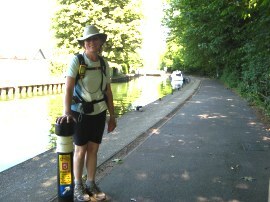 We met up in Reading before I drove us over to Wallingford for the start of the walk. 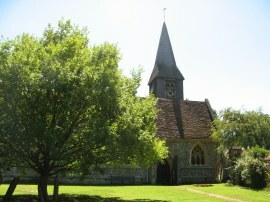 After a succession of cloudy and windy walks over the last five or six weeks the weather was finally bright and sunny, not too windy with the temperature reaching around the 30c mark in the afternoon. 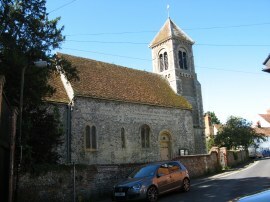 The car park in Wallingford is on the route of the Thames Path and we were soon on our way the short distance down Thames Street to St Leonards Church, photo 1. Here the route joins an alleyway on the left that heads round to join a lane which leads the few yards back down to the river, photo 2. Back at the river the path heads past a small boat yard and continues along downstream, passing across the bottom of the gardens of a number of fine houses before heading under the A4130 to head alongside a less developed area of land. At times the path headed in a green tunnel along tree lined stretches of the river bank which did a good job of keeping the neighbouring river almost hidden from view, photo 3, as well as providing some welcome shade and shelter from the sun. 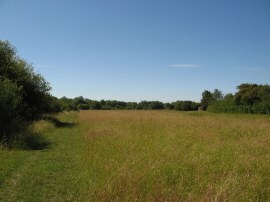 In other places the path headed along the edge of grass covered meadows, photo 4, with occasional views of the Thames appearing through gaps on the hedges lining the meadow, photo 5. 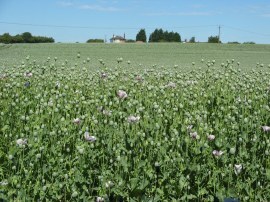 As we had been driving over from Reading we had spotted a number of poppy fields in the distance and at one point the path headed alongside one of these where a few of the plants still in bloom with their pale purple flowers, photo 6, as opposed to the more common red flowered type that I am used to seeing on disturbed ground on the South East. 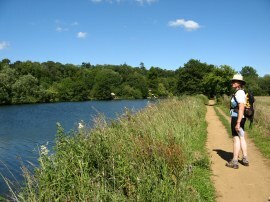 This was a particularly pleasant stretch of path as we made our way downstream towards the village of Moulsford. 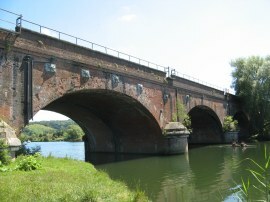 Just before we reached Moulsford the route passes under a couple of brick built railway bridges which carry the Great Western Main line over the Thames, photo 7. Having passed under the bridge the route heads away from the river bank and heads round the edge of a field and then alongside a playing field to reach the A329 in Mouslford. 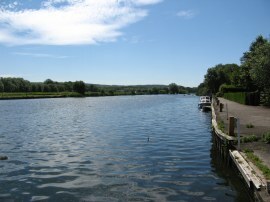 Here the Thames Path heads to the left down the road through the village before turning to the left down Ferry Road where the riverbank is rejoined, photo 8, the path reaching the river down the left hand side of a public house. 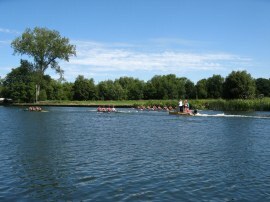 On the river we were passed by a number of rowing boats, photo 9, being coached from a small motorized launch. There then follows a fairly long section of path where the route runs alongside meadows and fields as the route makes its way down towards Cleeve Lock. 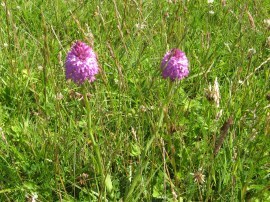 There were still a few flowers in the meadows and including some orchids, photo 10. 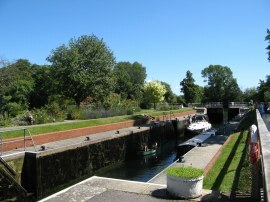 The path continues ahead past the lock, photo 11, which if I have been counting correctly is the 19th lock the Thames has passed heading downstream. 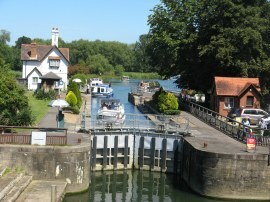 The lock has the smallest fall on the river at only 2 ft 3 inches. 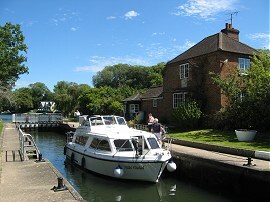 The reach above it back up to Benson Lock is the longest at six and half miles and the reach below to Goring Lock it is the shortest on the non-tidal river. 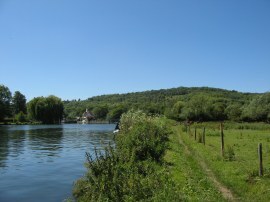 The path then continues on towards Streatley as the River Thames approaches the Goring Gap. 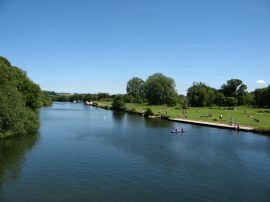 The Goring Gap was the channel the river cut through at the end of the last ice age with the Berkshire Downs, photo 12, rising away to the right of the river and the Chiltern Hills on the left. 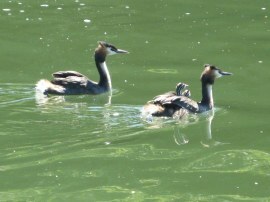 As we were walking down this stretch of path we spotted a couple of Crested Grebes on the river with two young ducklings being carried on the back of one of the birds, photo 13. Just before the line of weirs at Goring the route heads up to the right to join a track which runs into Streatley, passing St Mary's Church before heading to the left along the B4009. As we were passing by the village hall there were a number of walkers and a table and chairs set up besides a car and one of them asked us if we were members of the LDWA. A number of people there were wearing T shirts with the slogan Thames 250 on them and it turns out that the village hall was the location of the end point for the second Thames 250 Ultramarthon, a 250 mile non stop race that was run between the 22nd June to 26th June 2011 which makes our 18.5 mile effort on the day seem positively feeble. 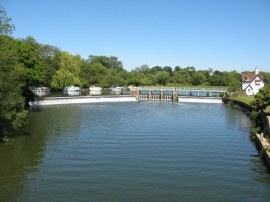 The route follows the road over the river giving good views back to the long weir, photo 15, as well as down to Goring Lock, photo 16. Reaching the end of the bridge the route over the road and down to the right to rejoin the towpath however first we made the short detour up to the lock where we stopped and had an ice cream sitting on a bench besides the lock before continuing on our walk downstream. The path soon heads out back into the countryside although there was the occasional impressive house to be spotted between the trees along the riverbank. 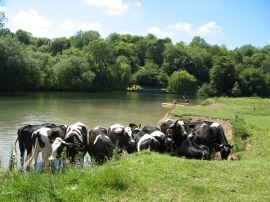 Just below the bridge at Goring we had seen someone swimming in the river and as we headed downstream we came across a number of cows all huddled together in the water, cooling off in the river where there was an area of shallow water, photo 17. 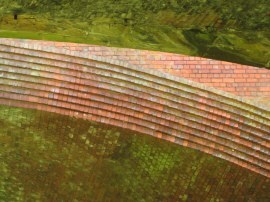 Not much further on the path passes back under the railway lines under another brick built bridge, photo 18, before continuing on to the site of the old Gatehampton Ferry with the hills of the Chilterns rising ahead on a very attractive part of the river. Here the path reaches the garden of a cottage and heads inland a short distance to join a fenced track running parallel to the river. 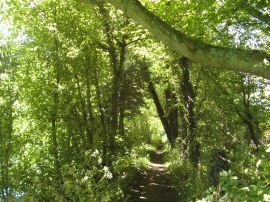 At first the path runs along side a long field before reaching the trees of Lower Hartslock Wood. The route then heads through the trees, from where there are the occasional brief views down to the river, before ascending uphill to another area of farmland to reach probably the highest point above the river of the entire walk. 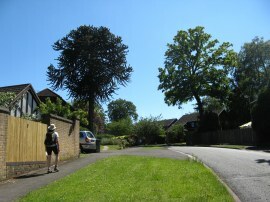 The track then heads downhill between the fields to cross a shallow valley, photo 19, before heading quite steeply uphill to join a tarmac driveway by Coombe Park Farm. This drive is followed for some distance along to the B471 on the outskirts of Whitchurch. 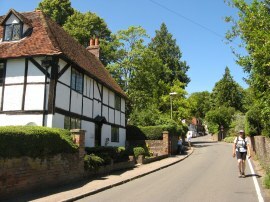 Here the route turns to the right, heading downhill along the road through the village, photo 20. Reaching the church the route detours briefly from the road to pass through the churchyard, heading to the left of the church, photo 21, along a path that leads to the old Whitchurch Mill. 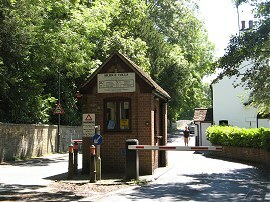 Here the route heads to the left along a driveway back to rejoin the road by the toll booth at the start of the Whitchurch Bridge, photo 22, which is one of only two privately owned toll bridges over the Thames and carries the road between the villages of Whitchurch-on-Thames in Oxfordshire and Pangbourne in Berkshire. 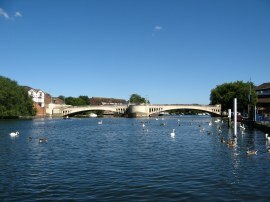 The Thames Path cross over the bridge before heading to the left through a car park beside a sports centre to rejoin the river bank at Pangbourne Meadows, photo 23. 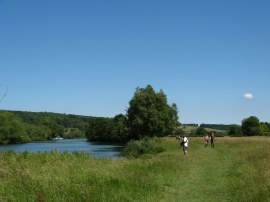 The area closest to the car park was packed with people out enjoying the warm sunshine although the crowds soon diminished as we headed on downstream, photo 24. 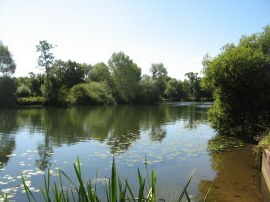 The route then heads through a succession of river side meadows as the Thames slowly curves its way round to Mapledurham. 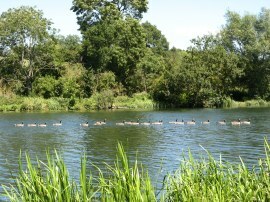 There were numerous birds and ducks about as well and we also spotted the line of geese in photo 25 making there way steadily down river although they looked considerably more impressive in real life than in the photo. Reaching Mapledurham Lock, photo 26, we finally found a spot in the shade in which to sit and have a rather belated lunch break on a bench besides the lock, having already walked 13.6 miles by this point. Just below the lock the route of the Thames Path is forced to leave the river bank once again and head inland, running between a couple of field to join a surfaced track, Mapledurham Drive, with houses to the left. At the end of this the route heads briefly left before continuing ahead uphill along New Hill. Just after crossing a bridge over some railway lines the route heads to the left along Hazel Road, photo 27, winding its way through the modern houses before continuing on into Skerritt Way. Reaching the end of the road the path heads up some steps on the right to join the A329 Oxford Road. A short distance along the road the path passes a large sign saying Reading although the path is still several miles from the centre of the town. Fortunately the path does not head along the main road for long and soon joins a footpath besides an old pub where a very faded sign on a window said closed for refurbishment which clearly is currently is not taking place. This path heads down some steps to cross a footbridge over the railway from where it was just a few paces further back to the river. The Thames path then heads along a tree lined section of path with the railway lines running away to the right; the trees providing some more welcome shade from the sun although on a less bright day this section of path is probably a bit gloomy. According to a notice attached to a post this section of path was due to be closing the next day for re-surfacing works which would have involved a lengthy extra stretch of road walking away from the river which we luckily avoided although having subsequently looked at the national trail website and other sites the diversion had been supposed to have started three weeks earlier on the 6th June and actually started on 11th July. After about a mile the path bends away from the railway line, skirting along the edge of an area of meadows which made a surprisingly pleasant entrance to Reading, photo 28. 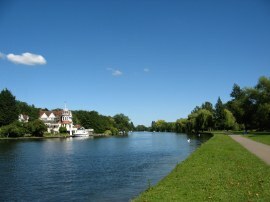 Here the views over the river opened up once again and the path passed by a number of particularly fine houses on the opposite bank. 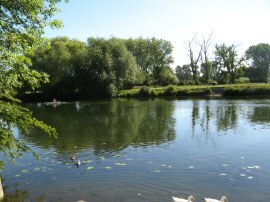 The meadows eventually give way to the more formal area of parkland of the Thameside Promenade, photo 29, which runs alongside the river down to Reading Bridge, photo 30. The promenade was full of people and on the opposite the bank the array of fine houses continued, including one with a helicopter parked in the garden. Passing under Reading Bridge the route runs alongside an area of modern housing developments on the river bank with Fry's Island, photo 31, out in the middle of the river. 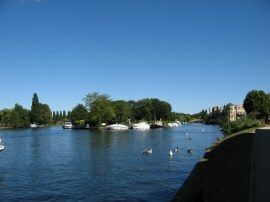 This stretch of path leads down to the Caversham Bridge in Reading, photo 32, from where we just had a few yards further to walk along the river bank to reach the end point of this stage of our walk along the Thames Path, just above Caversham Lock, photo 33. From there we had a very short walk across a park up to the car park in Napier Road where we had left the car. This car park is free on Sundays but costs a whacking £7 per day at other times. Reaching the cars we had walked a total distance of 18.5 miles, almost all of which had been along the Thames Path. I am a great fan of hot sunny weather but this day was almost too hot for me and I was beginning to feel a bit tired by the end of the walk. Still it had been another enjoyable walk and one in which we had made significant progress down the path having passed through the Goring Gap and into an area I am a bit more familiar with. 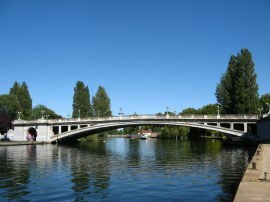 As usual I have uploaded the route of the walk which can be accessed here: Thames Path Stage 7 Route.